4. What is the best cheap dog insurance? 6. What to check when looking to buy cheap pet insurance? Dog insurance can offer you peace of mind against unexpected vet bills. However, trying to find cheap dog insurance that covers what you need can be difficult. So we’ve compiled a list of the cheapest dog insurance providers in the UK, based on the average price of all the policies they sell. Compare the cheapest pet insurance quotes for dogs. See our list of 9 companies that do cheap pet insurance for older dogs. If you have a cat, see some of the best cheap pet insurance for cats. Make sure to read the small print and that the cover level you get will be sufficient if your dogs get ill and you have to claim. Bought By Many's 15% multi-pet discount is the biggest multi-pet insurance discount on the market. The monthly premium for two two-year-old medium size mixed breed dogs living in Milton Keynes on our Value policy would be £10.22 with an excess of £69 and a co-payment of 20%. The same two dogs on our Regular policy would cost £18.70 per month to insure with an excess of £69 and 20% co-payment. Regular comes with £7,000 of vet fee cover and the limit renews at full every year even if you've claimed. Select Regular and choose the slider to see all three excess levels available, including our £0-excess option. (Based on the average price of all policies sold by each provider. Individual policy prices can vary). The research is based on 2017 data from market research agency Consumer Intelligence. Consumer Intelligence has collected data on the prices paid for dog insurance in the UK. 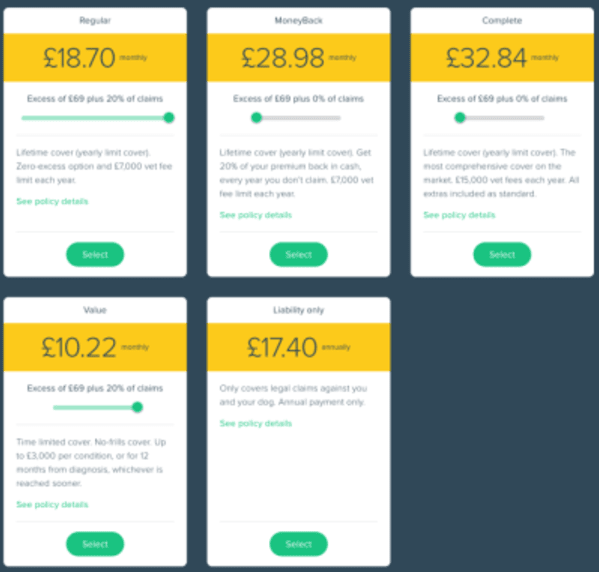 We calculated the cheapest dog insurance providers based on the average price paid by customers across all the insurers' policy types. Individual policy prices can vary. Learn what you need to consider when looking to buy a cheap pet insurance policy. Cheap pet insurance usually offers lower levels of cover than more expensive policies. Often, cheap policies will only cover accidents although some providers will offer a policy that covers some vet fees. When buying cheap pet insurance check that you're happy with the level of vet fee cover offered. Some pedigree breeds are more prone to illness and diseases that can cost a lot to treat. A lower level of vet fee cover may not cover all costs if you need expensive treatment. In 2016, an English Springer Spaniel needed £3,400 of vet treatment after becoming ill from swallowing a grass seed, according to the Association of British Insurers (ABI). The ABI says the average pet insurance claim hit £750 in 2016. The benefit of cheap pet insurance is that your monthly or annual premiums will be low but you could end up having to pay for treatment out of your own pocket if a claim exceeds the vet fee limits of your policy. There are ways to get discounts on policies. For example, you can claim a 15% discount with Bought by Many on our multi pet insurance. Bought by Many offers a range of policies, that can suit your budget and requirements. From cheap low cost no frills cover to the most comprehensive cover available - our Complete policy, that also includes Dental cover as standard. Find out more about our pet insurance. What is the best cheap dog insurance? Below we review the top 10 cheap dog insurance providers in the UK and look at their cheapest and most expensive policies. The reviews do not include any standalone Public Liability insurance offered by providers. These policies can cost around £20 a year but they do not cover any vet fees for accident or illness. Liability policies cover costs if your dog injures someone or damages their property. 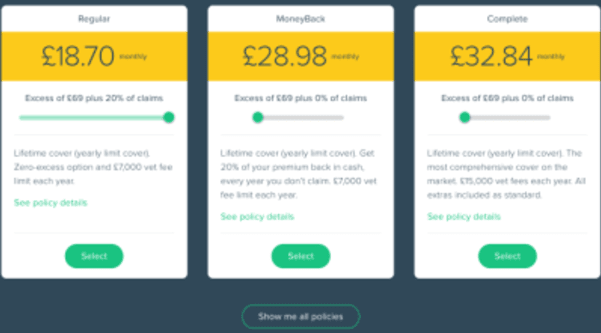 To help you compare cheap pet insurance from different companies and the type of cover you'd get compared to the most expensive policies these companies offer, we've reviewed some of the best pet insurance companies in the UK below to give you an idea of how much they'd charge. For cheap dog insurance E&L offers the lowest average price. E&L says its policies can start from £9.20 per monthly policy. For cheap dog insurance, E&L’s Silver policy will cover £3,500 of vet fees with a £1,000 limit per condition, £500 for death of a pet and £500 for loss by theft or straying. This is its basic cover, under its yearly policy. Their most expensive insurance policy is their Diamond cover, where you can get £5,500 worth of vet fee cover a year, £1,250 of cover for the death of a pet and £1,250 for theft or straying. E&L also offers Lunar polices, with slightly different cover levels and pricing. Petpals is the second cheapest dog insurer. According to its website, pet insurance can start from as little as £4.95 a month, based on a 4-month-old Yorkshire Terrier living in Blackburn. For cheap dog insurance, Petpals' TimeCare Essential policy offers £1,000 of vet fee cover for illness and injury. Petpals' most expensive dog insurance policy is ConditionCare, offering £3,000 in vet fee cover. Insurance Emporium is the third cheapest dog insurer on our list. Prices can start as low as £5.50 a month on a time-limited Bronze lunar policy with an introductory discount. This is based on a small mongrel, under 8, living in York (information taken from Insurance Emporium's website). Insurance Emporium's cheapest yearly policy is Accident Only, offering £2,500 of vet fee cover. The most expensive yearly policy is Insurance Emporium’s Lifetime Gold offering £6,500 of Vet fee cover, £1,250 of death cover and £1,250 of cover for loss by theft or straying, as well as other benefits. Insurance Emporium also offers insurance for older dogs. Find out more about insurance for elderly dogs. The fourth cheapest dog insurer is Pet-insurance.co.uk. Prices can start at £7.33 for its cheapest policy, the Standard. The policy offers £4,000 of vet fee cover per condition. This policy is based on a monthly premium with an introductory multi-pet discount for a King Charles spaniel aged under 8 years, living in the GU11 postcode area. Their most expensive policy is its Lifetime cover. This can start at £9.71 a month, again based on the above criteria. Both policies offer death cover and loss by theft or straying. Animals Friends' cheapest dog insurance policy is Accident Only, which starts from £3.73 a month. The policy offers £2,500 per accident but there is a lifetime limit of £15,000 for all accidents. Animals Friends offers a range of lifetime policies, which offer between £1,000 and £6,000 per condition per year. According to its website, premiums can start from £7.50 a month, based on a small mongrel puppy in Carlisle. Insurance with Animal Friends can start from 4 weeks of age, with no upper age limit for older dogs. Dog insurance from Perfect Pet can cost around £2.98 a month, based on a small mongrel aged 1 year, in Truro. This is for its Accident Only policy, which it covers £1,000 of vet fees. If you’re looking for cover for injury and illness, its most expensive policy is Vital Extra Maximum Benefit. This offers £4,000 of vet fee cover, death cover and theft and straying cover. Perfect Pet offers insurance for dogs aged from 4 weeks as well as older dogs. 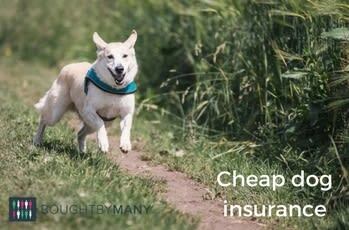 Pet Protect's cheapest dog insurance is its Lifelong Plus policy. It will cover £4,000 of vet fees, as well as loss by theft or straying up to £750 and death cover for up to £500. It also offers a range of other benefits. For more expensive insurance, its Lifelong Extra offers £6,000 of vet fee cover, loss by theft or straying up to £1,000 and death cover up to £750. Lifelong Extra offers a range of other benefits. Pet Protect will insure dogs over 8 weeks of age, however, they do not offer cover for senior dogs aged 8 years or over. Helpucover offers two cheap dog insurance policies. Its Time Limited Essential policy offers £1,000 of vet fee cover per condition for up to 12 months. Helpucover’s Per Condition policy offers £1,000 of vet fee cover per condition. Helpucover also offers more expensive policies. Its Life Time Premier insurance offers its best level of vet fee cover, at £6,000 per policy year. Helpucover doesn't offer cheap dog insurance for older dogs. The maximum age limit for buying a new policy is 8 years, or 5 years for some breeds. You can buy an accident only dog insurance from Paws & Claws that covers £1,000 of vet fees. Its most comprehensive dog insurance will cover £5,000 of vet fees per condition for accident or illness. Death cover is also available as is loss by theft or straying, though these are not available on all policy types and there are restrictions. The 10th cheapest dog insurance provider is UIS. Its cheapest policy is Crystal, an accident only policy with £1,000 of Vet fees per condition per policy period. Its dog insurance policy that offers the best level of cover is Diamond, with £4,000 of Vet fees for accident and illness per condition, per policy period. Death cover is also included up to the age of 8 years, as is loss by theft or straying. What to check when looking to buy cheap pet insurance? Check what excess is payable if you need to make a claim. This is usually a fixed amount that will be taken from your claim but some companies also take a percentage of a claim as a co-payment when dogs reach a certain age. Check for exclusions. There are often quite a few, and you don't want to get a shock when you submit your claim form. Some insurance providers offer Lunar policies that renew every 28 days. Bearing in mind a calendar month usually equals 30 or 31 days, the premium you pay over a 12 month period could turn out to be more than expected. You should check this when you do your research. You should always read the policy documents carefully, including what is and isn't included in your policy. The policy documents are usually available on the company's website. Forty-one percent of coupled pet owners list their pet as the factor most likely to influence their decision to stay in an unhappy relationship, according to a survey of 250 people conducted by Bought By Many.